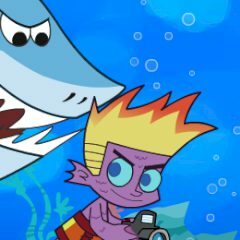 Johnny's super-genius sisters have given him gills and asked to make some catchy photos of the marine life (from “Johnny Test” by Cartoon Network). However Johnny wanna quest for sunken treasure. Dive deeper and deeper and try to scare away annoying fish with the flash of your waterproof cameras and not to get a punch while refilling your energy bar!